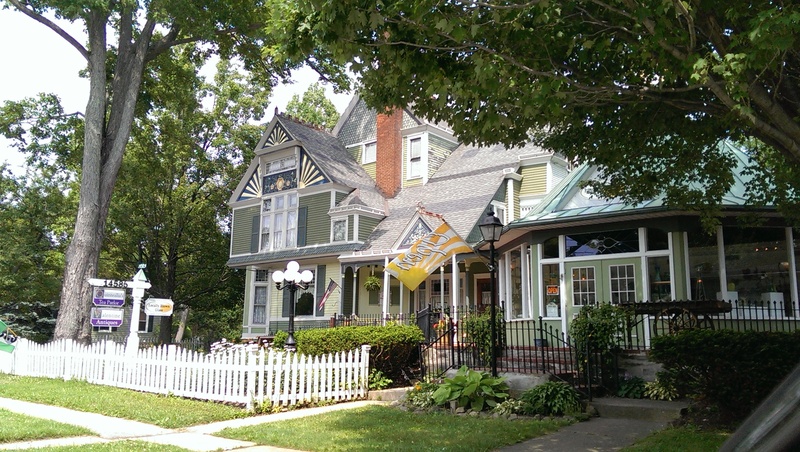 Quintealia’s is located in the historic Ford House, a beautiful 1891 mansion built by George H. Ford, Burton’s first mayor. The Victorian mansion is on the National Register of historical places. 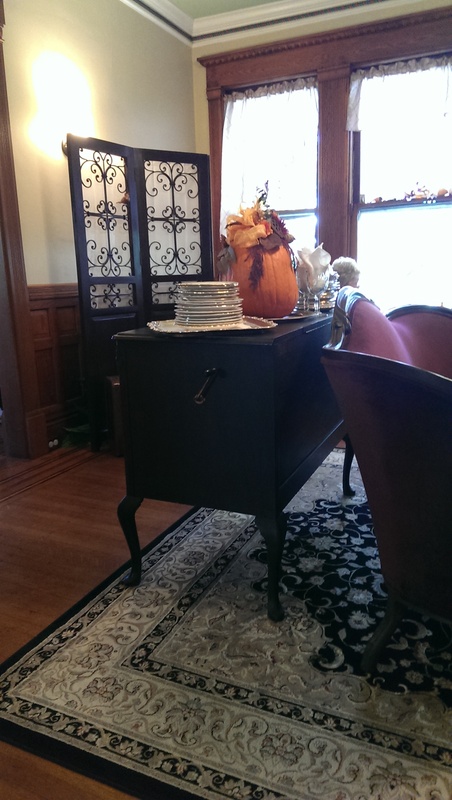 Quintealia’s features delicious tea and friendly service in a quaint and charming atmosphere. The Main Parlor boasts a fireplace, an 1880s Queen Anne velvet settee and matching ladies chair, and is decorated with rich gem colors and dark woodwork. The soft and feminine French Room is draped in lace and pastel pinks, and the table service is set with gold cutlery. The Ford Room, named after George Ford, the grand old home’s original owner, is adorned in quarter-paneled wood walls, old trunks, oversized wingback chairs and accents reminiscent of Old England. It is open Tuesday through Saturday from 11 a.m. to 4 p.m.
Quintealia’s offers a wide variety of loose leaf teas brewed at the perfect temperature. 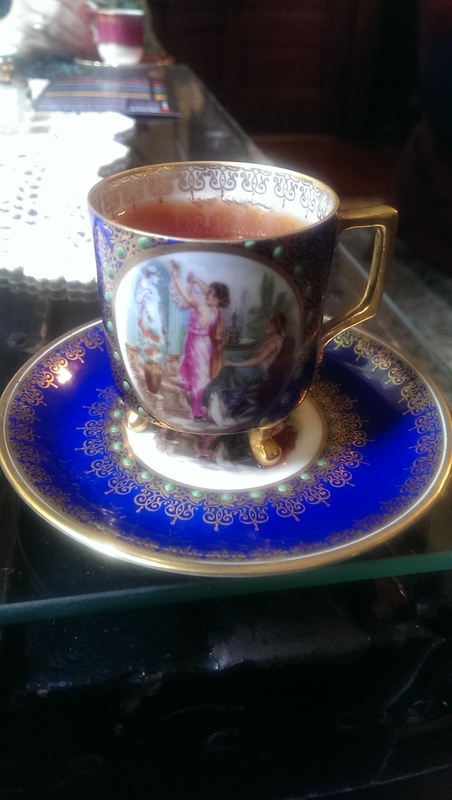 The servers are very knowledgeable and will happily help you choose the perfect tea for your tastes. The wide variety ensures that everyone can choose their favorite tea. Pots are happily refilled with hot water as needed. 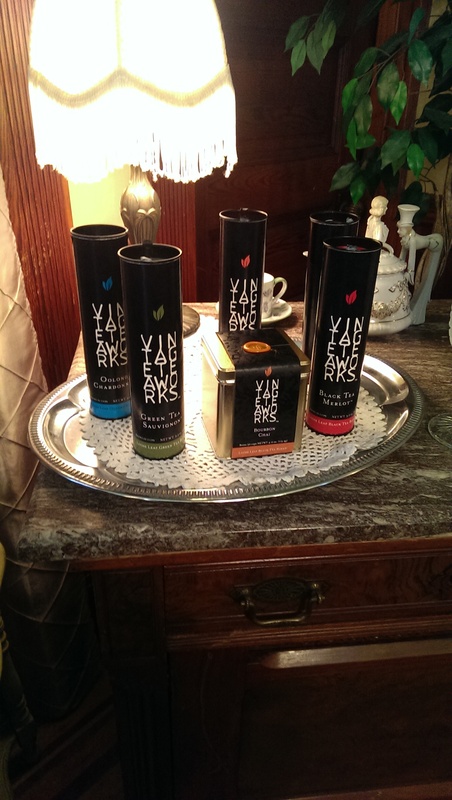 One of my favorite new finds at Quintealia’s are the wine-inspired tea blends by Vintage TeaWorks. The line of teas was developed by a lawyer in Akron who was passionate about both wine and tea and set out to blend the two. His non-alcoholic blends are deliciously aromatic and do a great job mimicking the notes of the various wines. The teas were voted Best New Product in 2012 by WorldTeaEast. From the light and playful White Tea Riesling to the dark and decadent Pu-Erh Cabernet, each of the six wine-inspired teas stand out in their own right. I attended a tea tasting of the line at Quintealia’s hosted by the personable Vintage TeaWorks founder, and each tea was better than the next, capped off with his delicious Bourbon Chai. I ended up buying the entire line and enjoy them at home cold brewed as well as hot. He suggested cold brewing the Rooibos Noir overnight in the refrigerator, and it quickly became my favorite thing this past summer. Although the Black Tea Merlot is my hands down favorite hot tea. Order one when you visit Quintealia’s. I promise you won’t regret it! 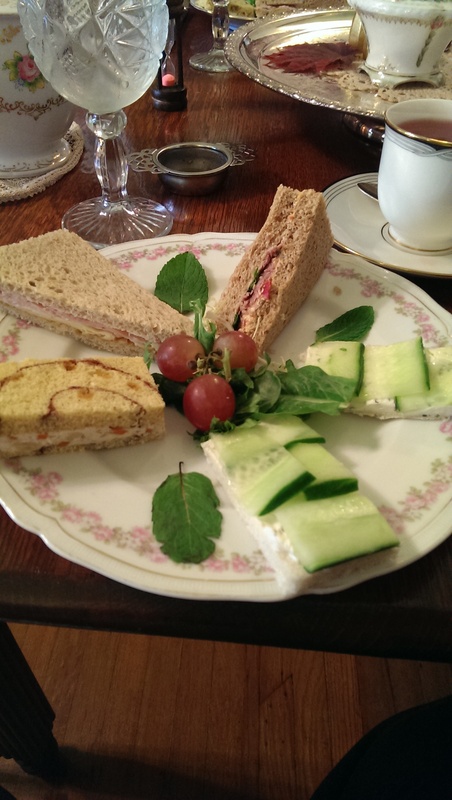 As for the food… my favorite thing to order here is the Savory Sampler for $10.95, which features four assorted tea sandwiches (although there are five in the photo on the right – I think the two cucumber sandwiches counted as one) and choice of a cup of soup or salad. 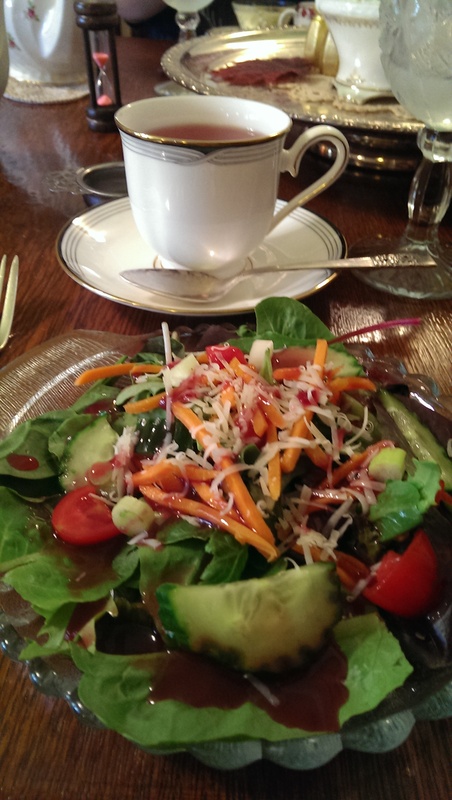 Their soups and sandwiches vary with the season, but they have been delicious each and every time I have ordered this. I particularly love the cinnamon raisin swirl bread with a carrot and cream cheese spread. The mint cream cheese on the cucumber sandwiches is also a great pairing that you wouldn’t expect. The scones are small but very flavorful. They also vary depending on the day. 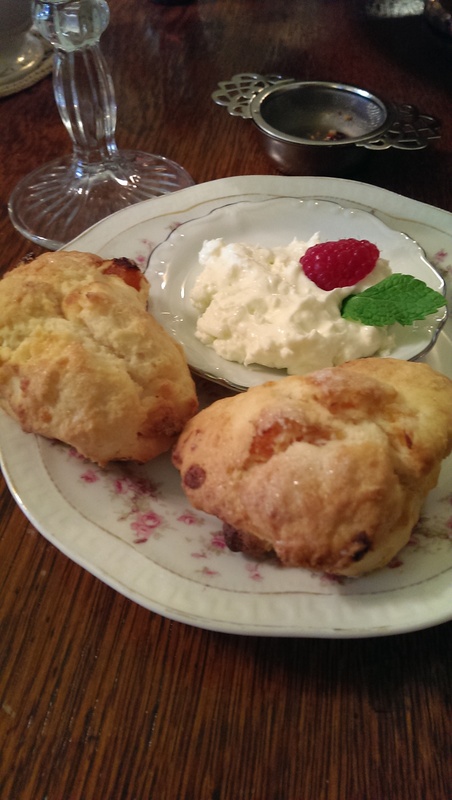 The white chocolate scone with raspberry was delicious, as are their savory herb scones. They serve Devonshire cream and jam with their scones as their Cream Tea for $7.95 that comes with a pot of tea or simply the Scones and Cream dessert selection for $3.95. The crispy flatbread ($10.95) is topped with melted Asiago cheese, artichokes, and your choice of sweet peppers or sausage. They served these as nibbles at the Vintage TeaWorks tea tasting, and we couldn’t get enough of them. They were delicious and addictive. I was less enthused about the Seafood Puff Pastry ($12.95), which features shrimp and whitefish tossed in a delicate dressing with fresh Parmesan cheese, baked in a puff pastry and accompanied by soup or salad. I was expecting a puff pastry, and it was more like a pot pie. If you like the idea of a seafood pot pie you’ll love it. 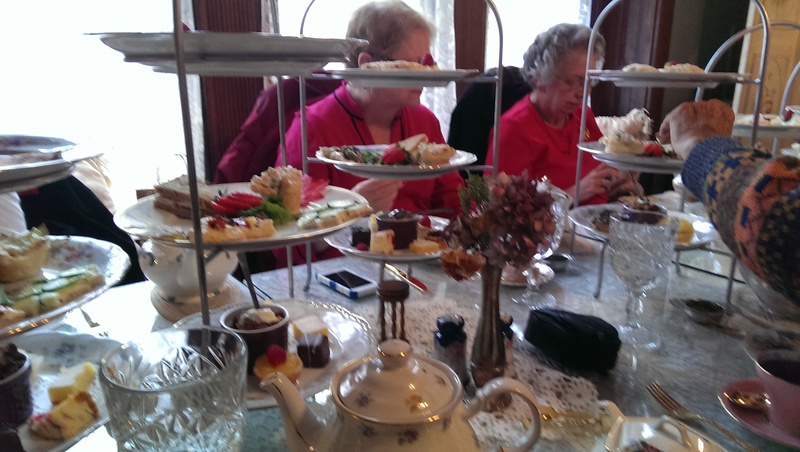 When I went here with my tea group the table was groaning with tea caddies loaded with savory and sweet selections (Full Afternoon Tea for $22.95). 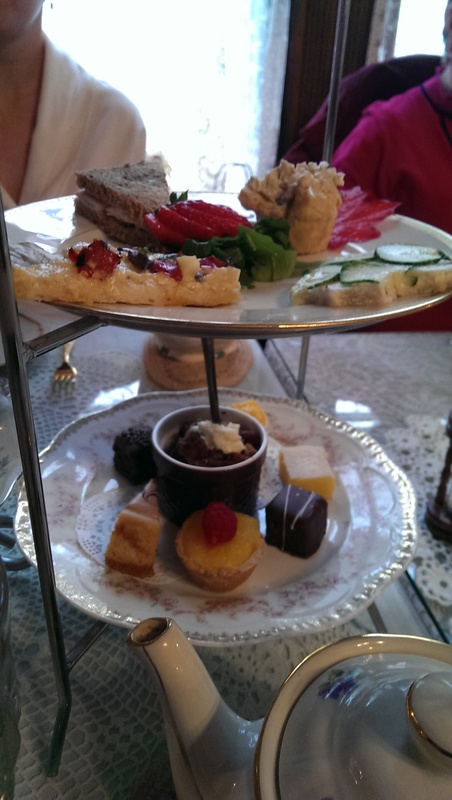 It features a three-tiered assortment of tea sandwiches, petite sweets, freshly baked scones with Devonshire cream and jam and a bottomless pot of tea. 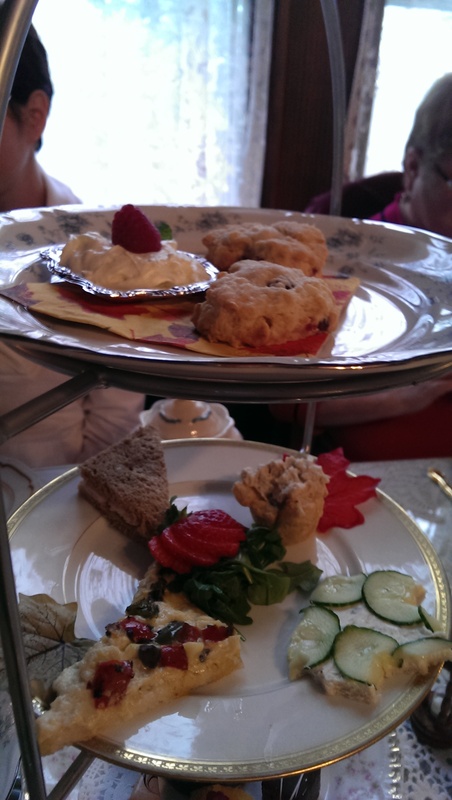 The scones were on the top tier (photo on the right). The middle tier had the tea sandwiches. The bottom tier featured the petite sweets. Most of us had to ask for boxes to bring some of the sweets home. They are very generous with this afternoon tea. The petite sweets alone are seven two- or three-bite desserts with choices ranging from cheesecakes, petit fours, brownie bites, tarts, lemon bars, bread pudding, cookies, and a variety of tea cakes and breads. The lemon meltaway bars and bread pudding are to die for!!! If you want a place to relax over a nice cup of tea and tasty food, a catch up with an old friend or a special place to celebrate with girlfriends be sure to check Quintealia’s out.